Oil on gesso primed board, 6" X 6"
At last, I’ve made a start and completed a couple of paintings. 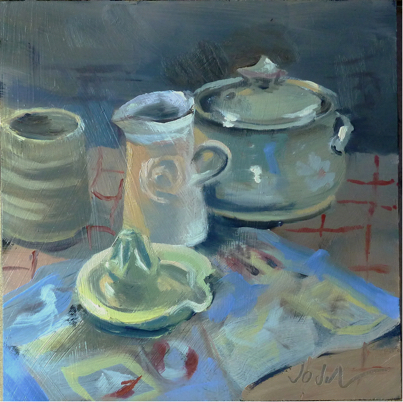 The first one is this small still life painting of some dishes from the kitchen. I decided to choose colours that were fairly close in colour and tone to try and create a nice greyish green and muted blue colour scheme. I enjoyed painting this little group. It finally got the creative juices flowing after a gap of too long! Hope you like it. The second painting is this oil on stretched canvas of a resting tiger which I finally finished off today. He looks as if he’s suddenly been alerted to some noise and is instantly ready to jump up and pounce on an approaching prey, or, beat a silent retreat if he decides that discretion is the better part of valour. 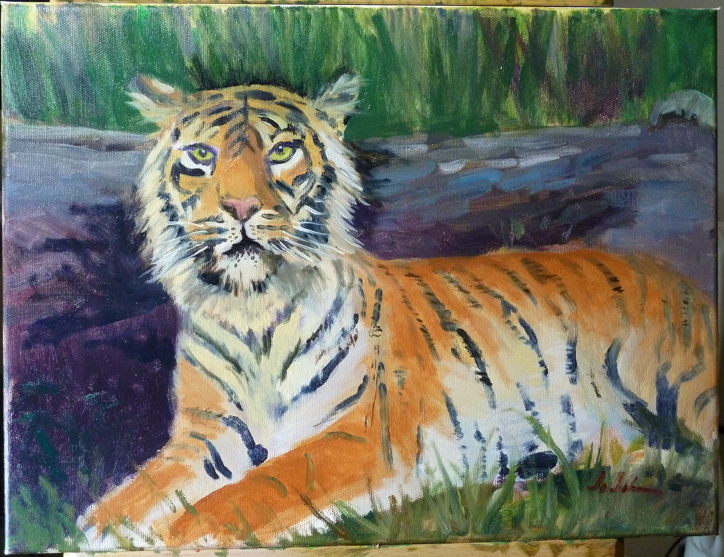 I think tigers are awesome creatures and great subjects for painting.